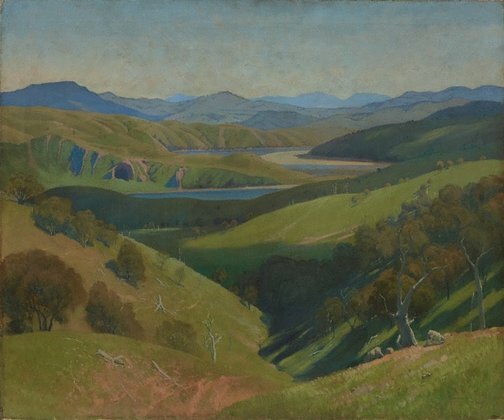 The sweeping mountainscapes of Gruner and Heysen of the 1920s were symbolic expressions of a pastoral utopia in which a purism of form - 'the simplification and reduction to essentials' - which evolved from the modernism of Europe, was adopted to suggest the spirit and essence of the landscape. Gruner's work became more severe in form and outline during this period, emphasising subtle harmonies of tone and colour and creating a feeling of stability and permanence, in contrast to his previous explorations into the evanescence of light and colour. "Form becomes of equal consideration with light, and his work is now more carefully organised, extremely simple, less immediate in direct emotional appeal, but infinitely more pictorial. Gruner has substituted the science of picture making for the science of painting light, preserving, however, that sense of light which made his earlier pictures remarkable ...". 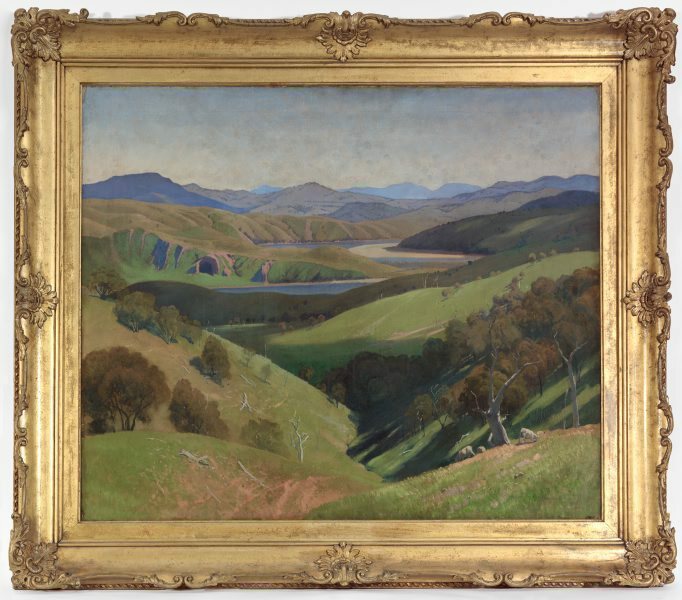 This painting won the Wynne Prize in 1929 and was acquired by the Gallery in 1930. Signed and dated l.r. corner, grey oil "GRUNER/ 1929". Deboarh Clark, Elioth Gruner: the texture of light , 'Elioth Gruner: the texture of light', pg. 9-89, Canberra, 2014, 61 (colour illus. ), 70, 96, 100. Dinah Dysart, The Wynne prize: an Australian landscape tradition , 'The public and critical response to the Wynne prize', pg. 15-22, Sydney, 1986, 18, 25. 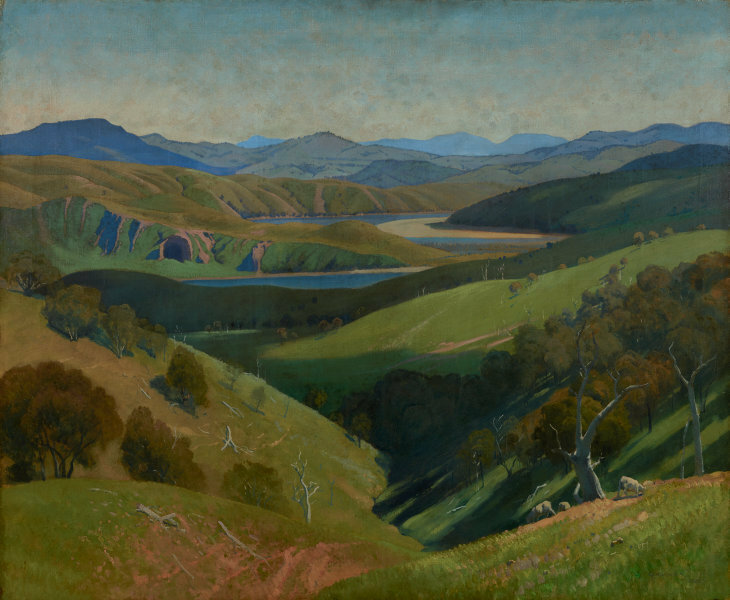 Lou Klepac, Parallel visions: works from the Australian collection , 'Hans Heysen / Elioth Gruner / Horace Trennery', pg. 32-47, Sydney, 2002, 143. Humphrey McQueen, Hemisphere , 'Humbly anonymous', 36-41., Australian Capital Territory, Apr 1979, 41 (colour illus.). Hal Missingham., Hemisphere: an Asian-Australian magazine , 'Paintings by Australian artists', Sydney, May 1957, 17 (illus.). The story of Australian art from the earliest known art of the continent to the art of today (Vol. 1) , Sydney, 1934, frontispiece (colour illus.). Julie Roberts, Art and Australia (Vol. 37, No. 2) , 'Seeing the light', pg. 222-231, Sydney, Dec 1999-Feb 2000, 229 (colour illus. ), 230. Sotheby's Melbourne: important Australian art (24 & 25 August 2009) , Melbourne, 2009, 15 (colour illus.). lot no. 6 is titled 'Study for 'On the Murrumbidgee''. The Big River show: Murrumbidgee Riverine , Wagga Wagga, 2002, 12, 13 (colour illus. ), 82. Editor Unknown (Editor), The Sydney morning herald , '"On the Murrumbidgee"', pg. 13, Sydney, 08 Mar 1930, 13 (illus.). Editor Unknown (Editor), The Sydney morning herald , 'Elioth Gruner exhibition: memorial to a master', pg. 6, Sydney, 17 Apr 1940, 6. Editor Unknown (Editor), Weekend advertiser , 'River of Wagga's dreams', pg. 24, Wagga Wagga, 12 Oct 2002-13 Oct 2002, 24.